If you have recently been injured, or cannot work for a diagnosed reason, disability insurance can keep you covered. Disability insurance is ideal for protecting you and or your loved ones from harsh financial burdens. The form of disability can completely vary and still qualify as a disability for your policy. Disability insurance can help ease the stress and hardship of not being able to work and can be a part of your individual or group benefits package. When a form of disability keeps you off the job, disability insurance keeps you financially protected. Call or email Puhl Employee Benefits with your disability insurance needs or questions. Our team is here to make sure you get the most from your disability insurance policy. Contact Puhl Employee Benefits today to schedule a disability insurance consultation! Puhl Employee Benefits Inc. is a benefits management company that helps with the management and implementation of personal or group benefits. You can trust all your group or individual disability insurance needs with the experts at Puhl Employee Benefits. We can help you find the ideal policy for you, your employees and your business addressing long-term and short-term disability coverage. Our team is here when you need us to help with your group benefit and individual insurance. If you are an employee of the business owner, we can help to find and implement the disability coverage you and your family need, providing individual disability insurance, group disability insurance, and business owner disability insurance. We have decades of experience helping individuals, business owners and employees with their specific disability coverage needs. From workplace injuries to chronic pain to mental health issues, disabilities can seriously affect your ability to function at work. When you have disability coverage and a form of mental or physical disability has taken you away from work for a prolonged period of time, you can file a disability insurance claim. After you claim is processed and approved you will receive monthly disability payments. If you have any questions about the process of your disability claim, contact Puhl Employee Benefits today! 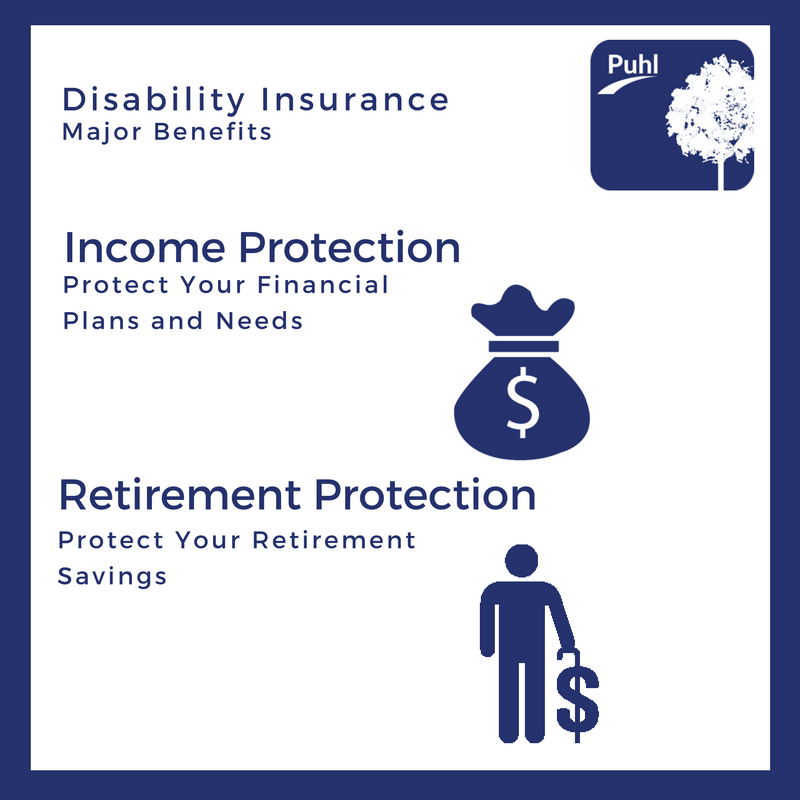 Income protection – Disability insurance helps to cover your household expenses and assist you in keeping your financial plans on track while you are unable to work. Retirement protection – disability insurance helps keep you financially stable while you aren’t working, to ensure your retirement plan stay on track.